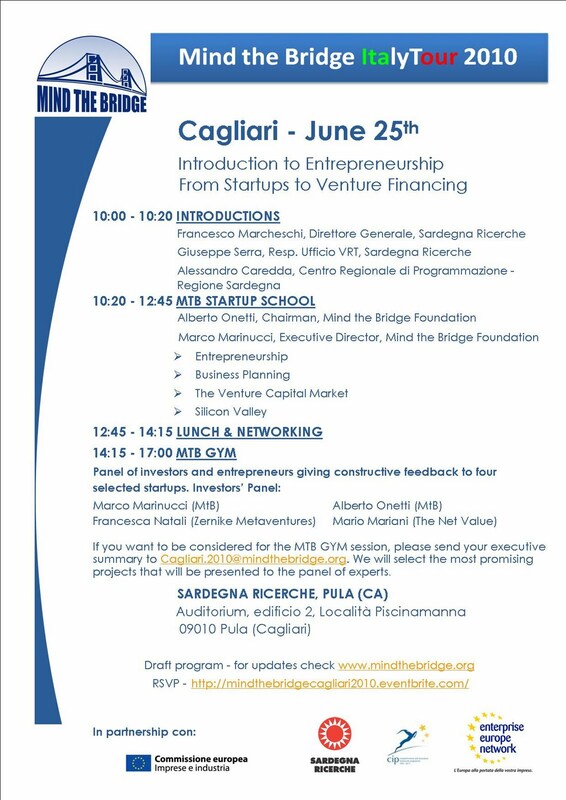 This week, on Friday (June 25th) we are in Cagliari, with the second of the Special Events of our Mind the Bridge Italy Tour. The venue is the Auditorium of Sardegna Ricerche in Pula (Edificio 2, Località Piscinamanna). It is a full day program. Startup School in the morning (with Alberto Onetti and Marco Marinucci on the stage) and a session of our MtB Gym in the afternoon. In the evening we organize - with the support of our local sponsor Hosteras - a cocktail event at Villa del Borgo Relais in Santa Margherita di Pula: a dreamplace where to relax and networking. Please remember to reserve your ticket: it is free, but admissions are limited. Here is the link for RSVP (remember you have to register twice, both for the day program and evening event). As you know, in the afternoon we are going to replicate here in Italy our Gym, i.e. the mentorship activity we regularly do in Silicon Valley with our startpus admitted to the program: companies presenting their business plans in front of a panel of venture capitalists and seasoned entreprenuers. Open discussion, comments, honest feedbacks. Ultimate goal is fine tuning the business idea (what and where it works, where and what doesn't) and making the value proposition more effective. We got a terific feedback from Sardinia: we received over 20 applications for the Gym session in Cagliari! Our Selection Committee worked all over the weekend for deciding the short-list of startups admitted to the Gymnasium in Cagliari. Not an easy task since we received a lot of plans, all of them quite interesting. As we always point out, not being in the list above does not mean that there is no potential in your plan. Thus we are looking forward to meeting all the startups (not only the selected ones) in Pula, where to share insights and provide some feedback. We strongly suggest to take part to the whole event with your entire management team (please register with all the members if you haven't yet done). Startups admitted to the Gym session have 10 minutes for presenting their idea (we will send you a template for helping you in structuring the presentation). Presentation will be followed by 20/25 minute time of Q&A. The key word of the Gym is open discussion and honest feedback. Then partecipating to the Gym session is a MUST for all the startups, not only for the ones we selected to present. Everybody can largely benefit from the discussion of all the business ideas as well as the education program in the morning.